Next week the voters of Lewisham East will go to the polls to elect a new member of parliament. 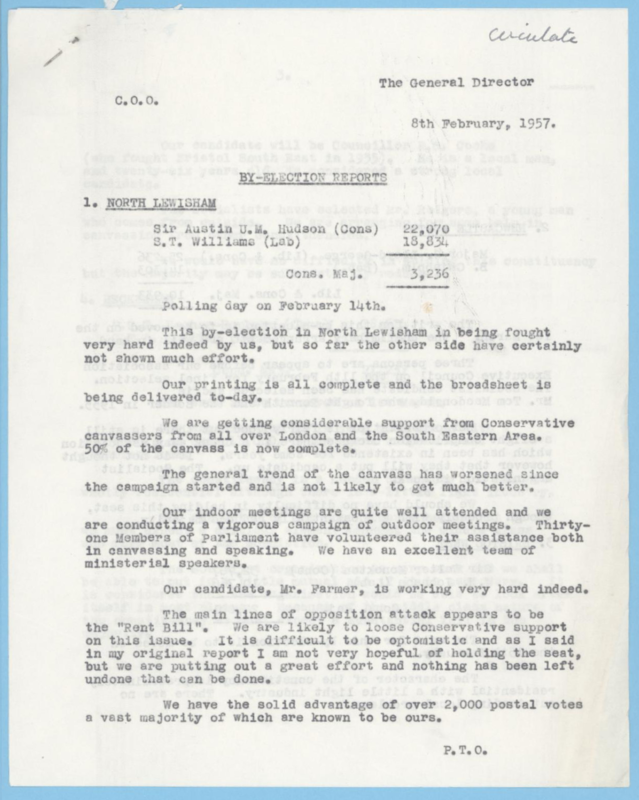 Using the collections of the Conservative Party Archive, this blog post looks back at the last parliamentary by-election in the borough, held in 1957. The letter was just one of many critical messages sent in by Conservative supporters around the country following the by-election, which had seen the party lose the seat to Labour on a swing of 5.5%. The vote had been the Tories’ first electoral test since Harold Macmillan had replaced Anthony Eden as Prime Minister – and it appeared that the change in leadership had failed to improve the party’s fortunes. 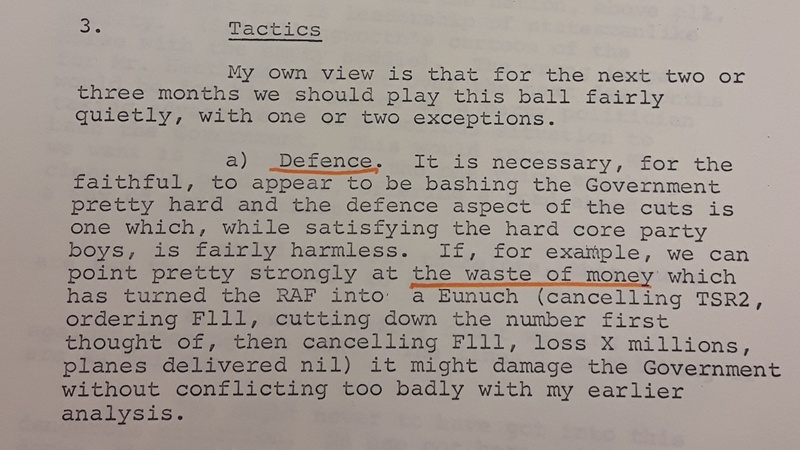 Another issue that haunted the Conservatives was the legacy of the Suez Crisis, which had brought down Eden’s premiership. Not only did Labour continue to attack the Conservatives’ handling of the episode, but in Lewisham North the party also faced a challenge from the right-wing League of Empire Loyalists, an imperialist pressure group that supported independent candidate Lesley Greene. Greene, who was also the organising secretary of the League, used her election address to denounce the government for the loss of British influence over Suez: “All but one of the Cabinet Ministers responsible for this sickening humiliation are still members of the Government. 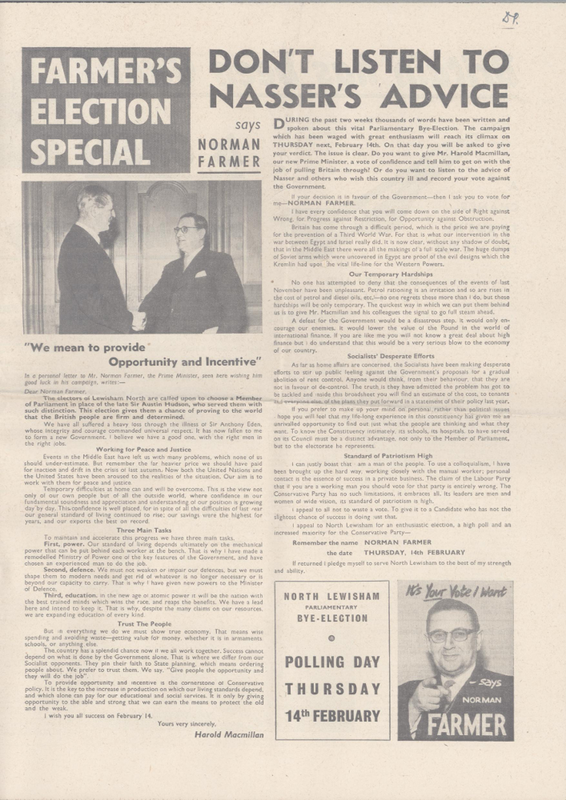 Where is their national pride?” [PUB 229/1/12] The Conservatives sought to counter such charges by appealing to voters’ patriotism: “Don’t Listen to Nasser’s Advice’ urged one of Farmer’s leaflets, claiming that the Egyptian leader wanted to see the Conservatives defeated. [CCO 1/12/25/2] The party failed to defuse the issue however, and the Conservatives were forced onto the defensive throughout the campaign. Unsurprisingly, Conservative post-mortem reports on the by-election defeat identified Labour’s campaign against the Rent Bill and the fallout from Suez as major reasons for the defeat. 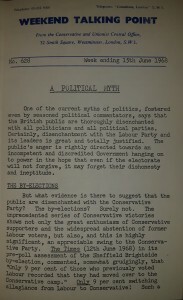 However, the party’s campaigners also identified more practical reasons for the failure to hold the seat:- Labour for instance were accused of deploying an illegal number of cars to ferry their voters to the polling stations (the use of private motor transport in elections was strictly regulated in the post-war period), while one Conservative canvasser berated the party for “knocking-up” their supporters too late in the day, as “it is difficult to get women to vote in the evenings as they have their husbands’ dinners to prepare”. 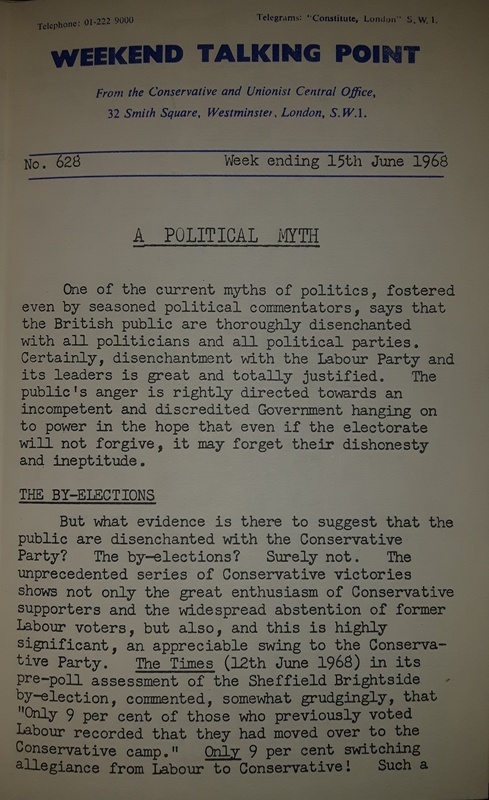 [CCO 1/12/25/3] Reports such as these offer a fascinating insight into the very different nature of election campaigns in the 1950s. The Conservative defeat in North Lewisham was ultimately short-lived: the party regained the seat in Macmillan’s 1959 general election victory, and subsequently held it until 1966. Even so, the contest gives us a snapshot of British politics at a time of great upheaval and change. Whoever wins in Lewisham East next Thursday, it might well be that historians of the future will similarly look at the records of the campaign in order to understand our own politics and times. 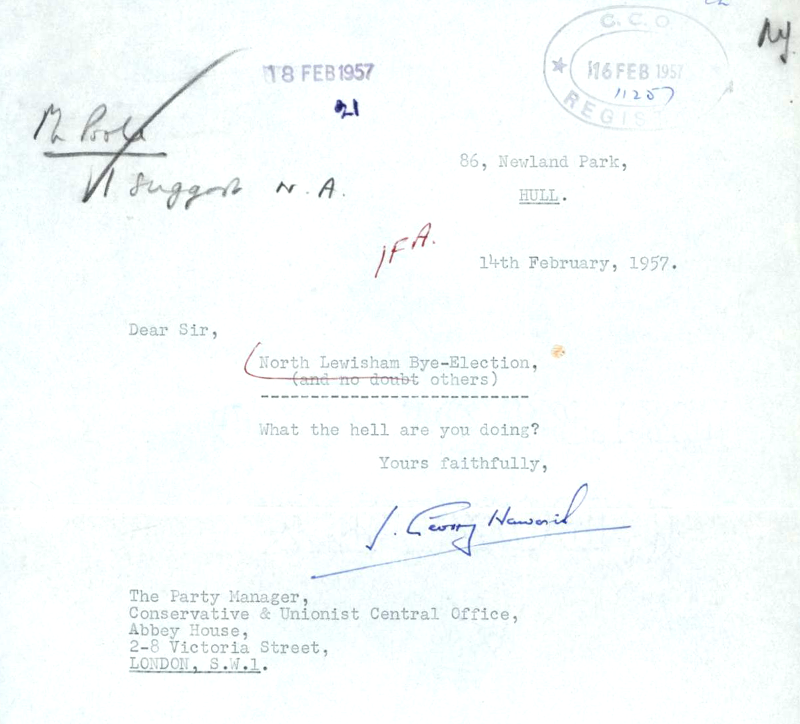 This blog is based on the Conservative Party Archive’s correspondence series and collection of historical election addresses. The archive as whole contains the official papers of the Conservative Party’s parliamentary, professional and voluntary wings, spanning from 1867 through to the present day. Visit our website for more information on our holdings and to view our full online catalogues. 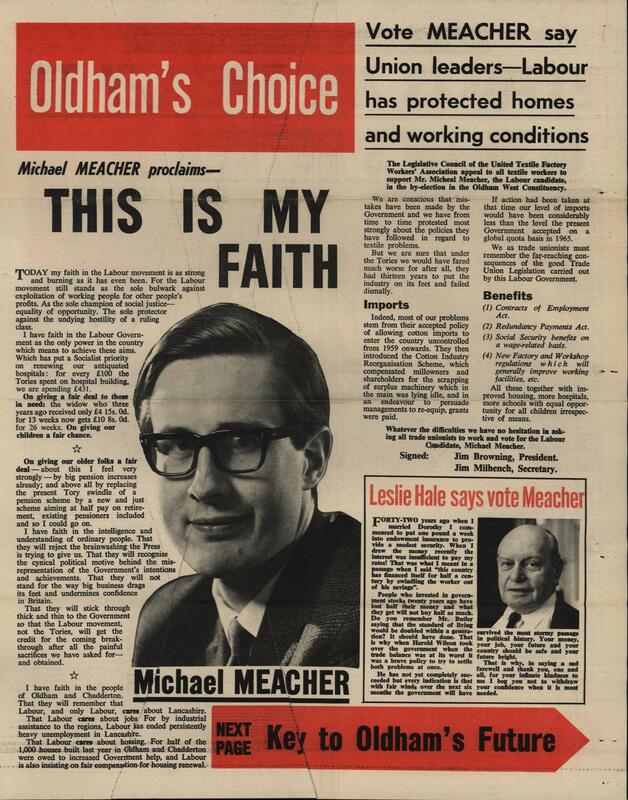 Polling Day in the Oldham West & Royton by-election takes place tomorrow, 3rd December, 2015, in the constituency formerly held by the late Michael Meacher, the veteran Labour MP who held the constituency for 45 years, who died in October. 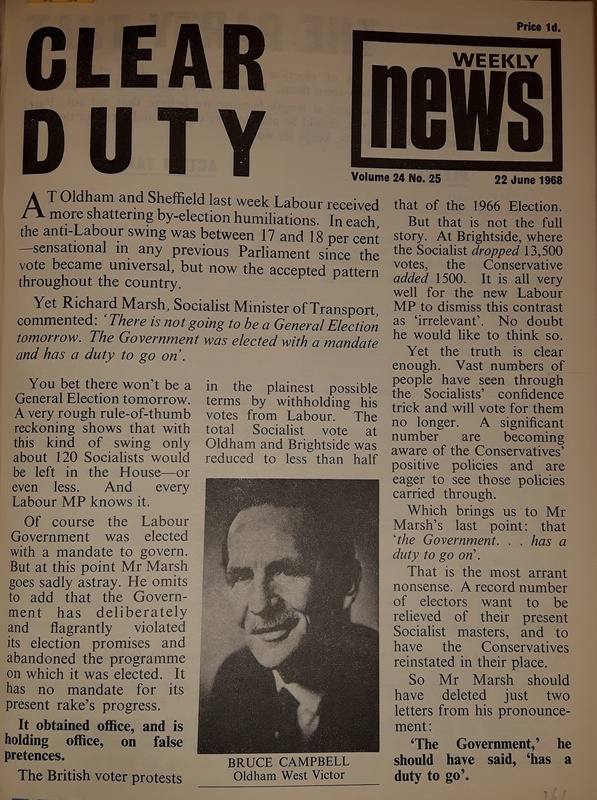 While the Westminster parties prepare for the voters’ verdict in this the first by-election of the 2015-2020 Parliament, the detailed records of Conservative Central Office, deposited at the Bodleian Library as part of the Conservative Party Archive, afford us the opportunity to look back to 13th June, 1968, when the last by-election was held in Oldham. While the conditions of 1968 were very different from today, there are some obvious parallels as well. The Oldham West by-election took place four years into the Labour Government led by Harold Wilson which had been strengthened by its 1966 election victory. But despite leading what was arguably one of the most socially progressive governments of the 20th century, Wilson was dogged by economic problems and imposed austerity measures in a number of areas – notably introducing prescription charges, increasing National Insurance contributions, and reducing tax allowances. In addition, poor economic growth and the large deficit had resulted in Wilson’s decision to devalue Sterling the previous year. Taken against this backdrop, some kind of protest vote was probably inevitable. 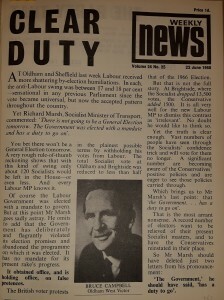 But the scale of the by-election defeats which Labour suffered took all the parties by surprise, and paved the way for the Conservatives return to power at the 1970 general election. The Oldham West by-election was the eighteenth of the 1966-1970 parliament, and the sixth of eleven by-elections to be fought in 1968 alone, of which eight resulted in Conservative victories, including five which were gains from Labour. Oldham West & Royton, as it is now, was created as a parliamentary constituency only in 1997, formed primarily out of Oldham West. Since the late 19th century, Oldham had demonstrated a marked preference first for the Liberals until the early 1920s and then for Labour (one of the few exceptions to this was Winston Churchill’s election there as a Conservative in 1900, though he subsequently crossed the floor to the Liberals in 1904). Since 1945, Oldham West had been represented continuously by Leslie Hale. A highly popular MP locally, at the 1966 general election he had been returned with an increased majority of 7,572. The by-election was caused by his decision to retire. I think there is always a tendency, perhaps, to be slightly nervous about old and dying industries – and often to over-compensate by paying too much attention to them…. [It] suggests to me that our campaign should concern itself more with the importance of the new industries rather than bemoaning the decline of the old. Mr Campbell is not an impressive figure. He appears to be very lacking in personality though probably a nice enough chap. In addition, even the Chairman tells me he is an appalling speaker. 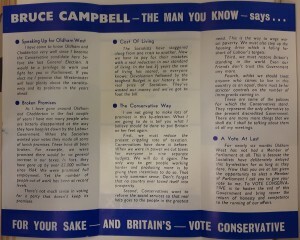 Mr Campbell is not a strong Candidate. Although he is an eminent barrister he is a poor speaker and seems to lack personality. However, he is highly thought of in Oldham and there is no question of any alternative. The Candidate’s political knowledge is limited and it will be necessary to have someone attached to him from Research for the period of the Election. Chris Patten was mentioned as a possibility, but with Conservative Research Department personnel stretched due to the spate of by-elections then being fought, he was directed to Meriden, where that by-election was due to be held on 28th March. To add to the Conservatives’ woes, their experienced local Agent was ineligible to take on the duties expected of him as an Election Agent during the campaign as he was then serving as the Mayor of Oldham. A temporary replacement had been brought in but after a 4-month delay in determining the date for the by-election, he had left, and the post was then filled by Mrs Blaby, a ‘qualified Women Organiser employed by the Area’. They claim that they have 17 MPs canvassing. With the exception of one press officer from Transport House no other officials other than the Area Agent for Yorkshire have been seen…. [They] do not strike me as being very high powered lists of speakers and the obvious missing links are Roy Jenkins, Barbara Castle, Michael Stewart, Anthony Crossland, Jim Callaghan, Richard Crossman, Dennis Healey, etc. 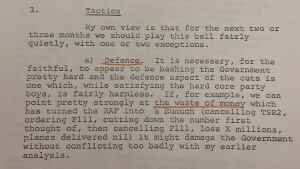 In contrast, the Conservatives persuaded a number of its Front-Benchers to assist in Oldham, including Bernard Braine, Selwyn Lloyd, Anthony Barber, Geoffrey Johnson Smith, Alec Douglas-Home, and Margaret Thatcher. The Conservative investment in Oldham paid off. Despite Central Office’s concerns about its candidate, Bruce Campbell was elected with a majority of 3,311, and a swing to the Conservatives of 17.7%. The Conservatives’, and Campbell’s, success in Oldham was short-lived, however. 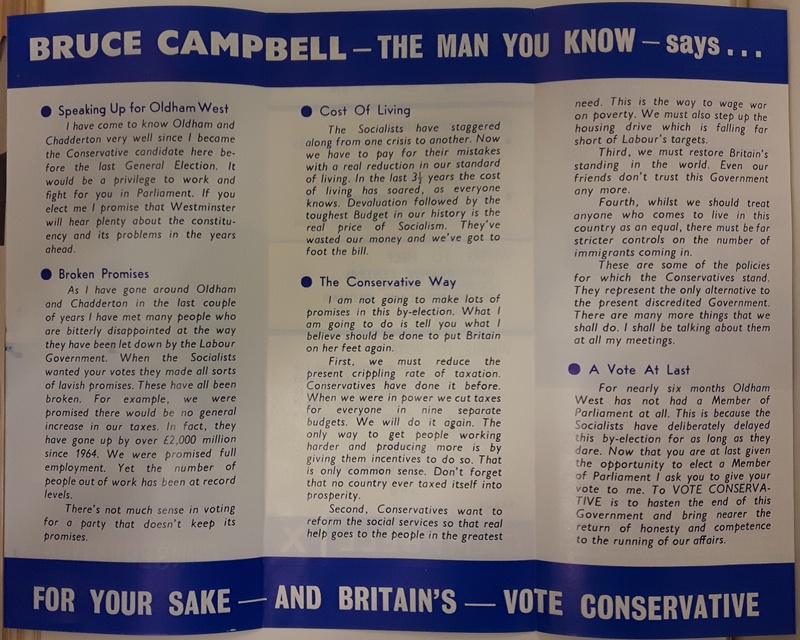 Despite the 1968 by-elections anticipating the national swing to the Conservatives at the 1970 General Election, Campbell bucked the trend and lost his seat, and Oldham returned to Labour control for the next 45 years. Campbell himself returned full-time to the Law and ultimately became a Circuit Judge. In 1983, he was caught by Customs attempting to smuggle whisky and tobacco into Ramsgate aboard his yacht, following which he received the ignominious accolade of being the first judge to be struck off by the Lord Chancellor.